LaTache gets makeover Reviewed by Edgeville Buzz on June 11, 2009 . 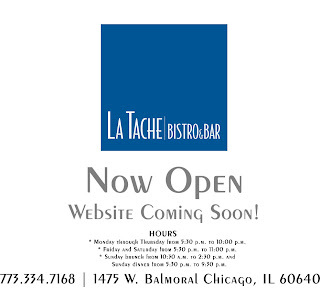 Neighborhood bistro LaTache, located on Balmoral just east of Clark, has underwent a makeover according to Dana Currier with Gapers Block. Most of the changes have been cosmetic and to the design of the restaurant and it’s logo while the food is “pretty much the same.” Check out Dana’s writeup here.